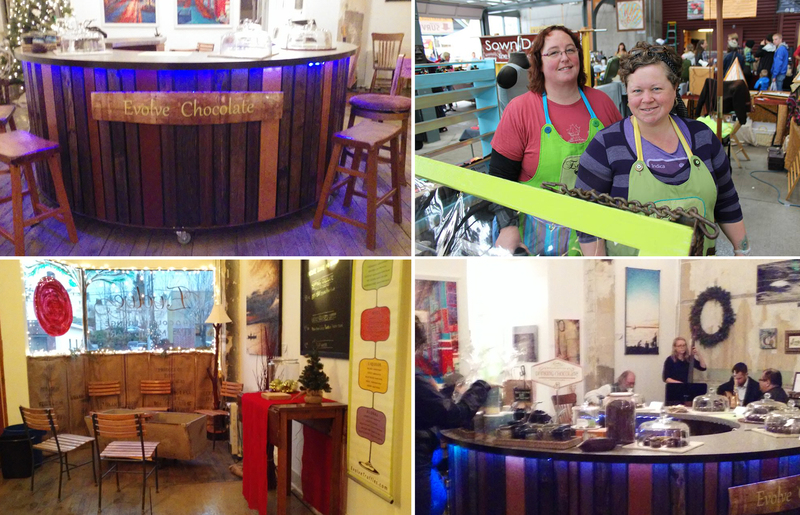 Check out our friend’s at Evolve Handmade Chocolate Truffles “pop up” Chocolate Lounge! 15 days of music, art for sale and their award-winning chocolate – complete with reclaimed material bar for serving! Through December 24th, you can find great gift sets of their treats, and daily specials including bouche de noel, nougat, marshmallows, and bark. 30% of sales will be donated to the non-profit Skookum Kids, caring for foster children in Whatcom County. And stay tuned for Valentines and Mother’s Day pop-ups from Evolve too! Friends of The RE Store and RE Sources since the beginning, Evolve Handmade Chocolate Truffles is dedicated to infusing locally-sourced ingredients plus soy free, fair-trade, non-GMO chocolate, while collaborating among the people and business owners of the Pacific Northwest region.